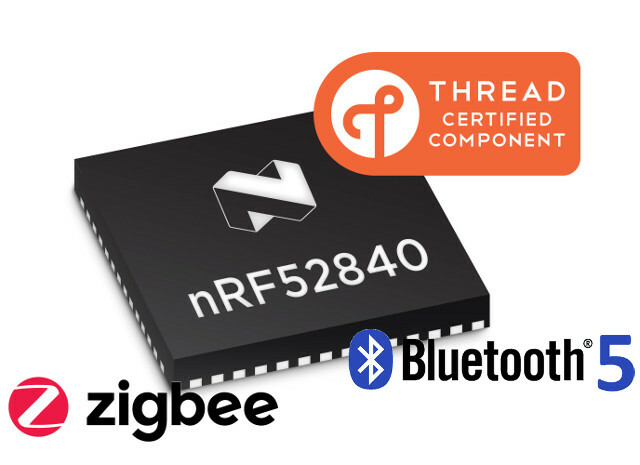 Nordic Semiconductor nRF52840 was introduced in late 2016 as one of the first Bluetooth 5 ready SoC, and it’s the only part from Nordic that fully supports Bluetooth 5 longer range. But the chip is actually a multiprotocol SoC and beside Bluetooth, 802.15.4, Ant, Thread and 2.4 GHz proprietary are also supported. The company has now announced one more wireless protocol working on nRF52840: Zigbee 3.0. The company has released the first engineering release for Zigbee on nRF52840, but the production grade Zigbee 3.0 certified release is planed for H2 2018. The new protocol will be enabled in the S410 v6.0 SoftDevice release. Bluetooth and Zigbee can run concurrently meaning for example you could create an nRF52840 gateway to control Zigbee smart lights from a smartphone connected over Bluetooth 5. The SDK includes examples for concurrent operation of Zigbee and Bluetooth 5 for a smart light bulb and switch. The company further explains raw data throughput rates of 250kbs can be achieved at 2.4GHz (16 channels) transmission distances range from 10 to 100 meters, and the technology supports large mesh networks and low power operation for extending battery life. It’s a nice chip and Nordic seems to be doing a lot of the heavy lifting on behalf of their customers when it comes to the firmware side of things, as they’ve built all the basic stuff for you and then some. Only downside is the comparatively high price of over US$4 in 1k quantities. That is a bit pricey for just a BT type device. This is multiproto- which means a bit more costs are involved. Does it run slightly higher than two or three of the separate chips combined? If so, there’s your answer- it’s because you’re wedging multiple capabilities into a single device. $4 and the SOB fits and has less overall parts, which makes it nearly a wash? Sign me up. Well, this is not quite true, as I know a company that sells BLE and 802.15.4 combo chips for under $1. Not ARM based, so they have no MCU license to pay for one. It doesn’t have ANT+ support either, but there doesn’t seem to be too many devices using that. Even so, hardware costs are rarely related to manufacturing costs or features, but rather what a certain manufacturer thinks the market will bear. Admittedly they have a fairly basic SDK and don’t offer nearly the level of software support that Nordic does, so they have lower overheads. Nor do they provide a Thread or ZigBee stack for free, even though both works on their chips. Obviously, compared to say Silicon Labs, this is not really an expensive part. I hope Thread would take off and take over Zigbee. Zigbee is quite offensive to open source. As not being IP-transparent, honestly I don’t know why Zigbee become quite popular protocol for both commercial and hobbyist.